Star Trac elliptical trainers are currently only available in four models for home use, but the quality of these is exceptional. The company, founded in 1987, caters primarily to commercial gyms, hotel chains and other venues where the elliptical machines will see plenty of use and abuse. Several years ago, in response to so many individuals expressing interest in their commercial grade trainers, Star Trac designed four elliptical trainer models for in-home use. These have not caught on widely in the marketplace yet, but those who own them are impressed. StarTrac elliptical trainers designed for the individual at-home user don’t skimp on the durability and high-quality parts. The price tag, from $3,000 to $4,900 and up obviously reflects this, so only buyers who are very serious about long-term use are going to order them. The company has a refreshing difference that sets them apart from the crowd – Star Trac ellipticals are made in the U.S.A., right in their California manufacturing facility. This is a distinct advantage if there is ever a problem with your elliptical trainer, and ordering parts gets you a remarkably quick turn-around from this company. The company’s elliptical trainers have the benefit of Star Trac’s Research and Development lab, also located at their manufacturing facility. Lots of time and money is spent in developing new innovations and improving performance for their commercial customers. The loyalty of gyms, condominiums and other large-scale commercial buyers is a reflection of the quality of StarTrac equipment. Although there isn’t a lot of selection for in-home buyers, the four elliptical trainers they currently offer have some excellent features, including small footprints, an exceptionally smooth glide and high weight limits (between 350 and 450 pounds). StarTrac’s elliptical machines are meant to take a beating and last for a long time. Currently you have the E-CTe, E-CTi, E-CT and S-CTx models. You can also add a 15" viewing screen to the S-CTX elliptical. We do wish Star Trac’s warranty on the home models was more reflective of the quality of the company’s elliptical trainers. Two years parts and one year labor is fine for mid-level trainers, but if you’re paying over $4,000, you’re essentially expecting a commercial grade machine with a commercial-grade warranty. Star Trac elliptical trainers should continue to gain popularity, especially if they add a few more to their line-up. Star Trac S-TBT Total Body Trainer - exactly the same unit as the total body trainers sold to fitness clubs for strenuous commercial use. Star Trac Elite - a crosstrainer with variable upper body workout. 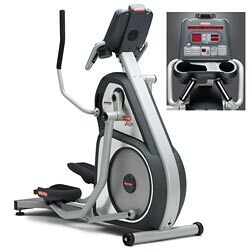 Star Trac Elliptical Edge - a gym grade remanufactured trainer for home use. Star Trac Pro - a great fitness investment.